For years, general industry employers have sought to prevent slips, trips and falls in their workplaces. Unfortunately, Subpart D, "Walking-Working Surfaces," has provided little in the way of clear, concise requirements. This has changed, however, with the finalization of a new rule on November 18, 2016, that took major steps in overhauling the existing standard. 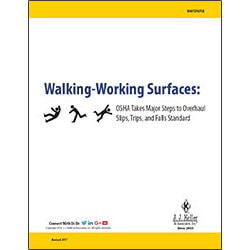 Fill out the form to download your FREE whitepaper - Walking-Working Surfaces: OSHA Takes Major Steps to Overhaul Slips, Trips, and Falls Standard.